Next up in our special coverage of this year’s Governor General’s Awards is our chat with Colleen Murphy, winner of this year’s GG Award for Drama (English) for her play Pig Girl. 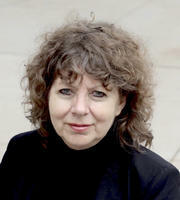 Colleen Murphy was born in Rouyn-Noranda, Quebec, and now divides her time between Toronto and Edmonton. Some of her other plays include The December Man (L’homme de décembre), which won the 2007 Governor General’s Literary Award for Drama, the Carol Bolt Award, and the Alberta Theatre Projects Enbridge playRites Award; Armstrong’s War; and The Goodnight Bird. She is also librettist of Oksana G., which gets its world premiere at Tapestry Opera in May 2017, and an award-winning filmmaker whose distinct films have played in festivals around the world. Pig Girl is a complex and harrowing piece of theatre. Can you talk more about the process of writing the play—particular challenges, fears, breakthrough moments? I followed the trial of the pig farmer in Vancouver in the summer of 2010 and got angry when the judge decided not to try the other twenty known cases. The play erupted out of my anger. It is a dark place in reality and a dark place in my imagination—dark, ugly place—so I had to struggle to find the human being in the Killer and, to a lesser degree, in the Police Officer ... much easier to care for the Dying Woman and her Sister. To love them and to want to protect them, but I could not protect them. The two time signatures in the play—the Dying Woman and the Killer playing out in real time, and the Sister and Police Officer playing out over nine years—was difficult to calibrate at first but slowly began to coalesce. It was stronger for the piece to not put names to the characters. During the writing, the late Iris Turcott gave me financial and dramaturgical support through Factory Theatre. After the staged reading, I asked playwright Yvette Nolan to advise me what changes I could make to the Dying Woman so that the part could also be portrayed by an Indigenous actor. She felt, and I agreed, that to ignore the Indigenous women who were taken on that farm was to disappear them yet again. I imagined that the Dying Woman refused to submit to the violence visited upon her—even while she is dying she fights heroically, not only for her life but also for the meaning of her life. She demands witnesses to watch her suffering because to watch is to honor her suffering, to give it meaning. I imagined that the Dying Woman refused to submit to the violence visited upon her—even while she is dying she fights heroically, not only for her life but also for the meaning of her life. Among a long list of recognition and awards, this is your second Governor General’s Award. How does this one feel? It means a great deal to receive respect from my peers for I often feel like a voice in the wilderness—that said, it was such a powerful shortlist of plays this year that I would have been content to lose to any one of them. What more needs to be done to ensure that Canada remains a vital, envied world leader in theatre? What’s your feeling about the next generation of theatre artists in Canada? Canada is ablaze with great theatre artists, and the next generation of playwrights and theatre makers possess a multitude of strong, distinct, and diverse voices right across the country—from east to west, north to south. But theatre as an idea, as a place, is going through a transition. Outside of the big subscription houses, smaller theatres often struggle for audiences, even regional theatres sometimes struggle to fill their seats for non-musical fare. It is important the next generation of playwrights have spaces to put on their plays and audiences to watch them. Putting on a new play should not have to take three years of raising money. The next generation of playwrights need support and infrastructure. They should not have to re-invent the wheel for a production of every new play. With support, they will carve their own paths, create audiences, and collectively influence the shape of theatre in the future. But theatre as an idea, as a place, is going through a transition. Outside of the big subscription houses, smaller theatres often struggle for audiences, even regional theatres sometimes struggle to fill their seats for non-musical fare. I believe these wonderful new playwrights and theatre makers will embrace drama over Ideology, that they will do whatever it takes—lobby, push, protest—to get live theatre back into the elementary and secondary education system, and finally, and most importantly, I believe the next generation of theatre artists will not be afraid of taking real risks in their writing—emotional and physical risks that smash the boundaries of theatre. I believe the next generation of theatre artists will not be afraid of taking real risks in their writing—emotional and physical risks that smash the boundaries of theatre. What’s your own litmus test for exceptional theatre? I go to the theatre to have an emotional experience ... to laugh to cry to think to be shattered to be transported to feel extra alive. I offer my whole self to a performance. Exceptional theatre is a fulsome experience. I am reading Madeleine Thien’s Do Not Say We Have Nothing and D. Peter MacLeod’s Northern Armageddon: The Battle of the Plains of Abraham. I recommend all the plays nominated for the GG this year—Brad Fraser’s Kill Me Now, an incredible story about disability and love; Donna Michelle St. Bernard’s A Man A Fish, a brilliant play about love and environmental sabotage; Jordan Tannahill’s Concord Floral, a beautifully disturbing journey of a group of teenagers; and Mary Vingoe’s Refuge, a powerful play about the suspicion a refugee from Eritrea faces when he comes to Canada without papers. There are two time signatures: the action between dying woman and killer plays out in real time, while sister and police officer experience time over the course of nine years. Dying Woman: Soon it’s gonna be light out. Tick tick tick. I’m waitin’, eh. She looks up at the moonlight. If I’m outside early I always look up to watch for a tiny dot of light at the edge of the sky—even when it’s rainin’ I can still see a tiny dot of light an’ that’s when I know the sun’s gonna come up. Killer makes kissing sounds with his lips. Dying Woman: You got yer fun—untie me. Sister: My sister’s twenty-seven years old. She’s an addict and a prostitute. Police Officer: Oh boy, here we go again. Killer: Yer soft like velvet noses, eh. Dying Woman: Don’t touch me. Sister: She was supposed to come to my son’s birthday party on Sunday but she didn’t show up—never called, nothing. Dying Woman: You gonna drive me back or what? Sister: She’s five six, hair about this long, black—sometimes she dyes it but last time I saw her—about two months ago—it was black and she was wearing her purple coat and a nice dress. Dying Woman: Don’t touch me no more. Sister takes out a photograph. Sister: Officer, I brought a photograph so you can report her missing. I’m going to get it enlarged and have posters made. Police Officer: She probably left town or changed her name—maybe she’s in a hospital under an alias. Wait a few weeks—she’ll turn up. Excerpt from Pig Girl reprinted with permission of Playwrights Canada Press. Read our interviews with GG winners Steven Heighton (poetry) and Bill Waiser (non-fiction)!